In the post On player communication I talk about the challenge of players communicating with each other on the court. It in part brings up the question of whether players really need to talk during play. That’s from the perspective of player responsibility. In other words, whose ball is it? With that in mind, I will share my own personal basic philosophy on seam responsibility. I’m happy to hear about different approaches. I take as my starting point the idea that the person with the shortest distance to go for the ball should take it. After all, it will take them less time to get there. Flipping that around, it means the player farther away takes the deeper ball. Generally speaking, it’s easier to go sideways or forward than to have to try to go backwards to play the ball. Here’s what that looks like in terms of serve receive. The star is the location of the server. So as you can see, the player who is closest to the origin of the serve is the one who takes the short seam between players. The one further away then takes the deep seam. And here’s what that same principle looks like from the perspective of a standard perimeter defense. Again, the star is the attack point. Of course you may use a different type of defense or locate your defenders differently in the perimeter scheme. The concept remains the same, though. The important thing is that players understand that the principle applies regardless of court position. They need to know instinctively who has the short seam and who has the deep one in all situations based on their relative positions. If they do you will drastically reduce the number of balls that land between players who are standing there looking at each other. Now, understanding seam responsibility when in serve reception or in defense is only part of the equation. There are other “seam” situations that should have clear rules. Here are a couple that come immediately to mind. Who plays the third ball over between a front row player backing up and a back row player moving forward? Who takes a ball that is set between two attackers? 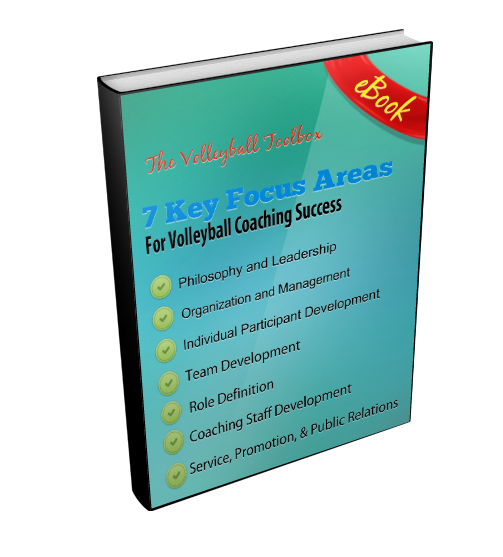 When does a middle hitter take a serve? Then there are other situations which influence who takes a ball, such as the setter releasing on a free or down ball. I’m sure you can think of a few of them. The point is, the players should understand these structural elements of how they play. There will always be situations that don’t fit into nice, neat structure, but if the players know the principles, they can deal with things effectively. When they reach that point, talking becomes less about communicating in-play and more about communicating between plays.